The auditorium contains 855 seats, a stage, and good sound and lighting systems. It is used for concerts, plays and films as well as conferences and exhibitions. The studio accommodates up to 146 spectators for small-scale events. An outdoor amphitheatre at the rear of the building is used for drama and music in the summer. The foyer contains a permanent exhibition space, often used by local artists and photographers. a function room for weddings and corporate events is available for hire, and can accommodate up to 100 guests. The Hawth also contains a restaurant, a coffee shop and two bars. Lunch is available between mid-day and 2pm Mondays to Fridays, and meals are available from two hours before most evening performances. 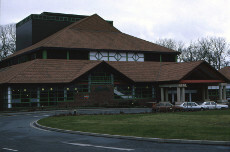 The theatre opened in 1988, although the first of many unsuccessful proposals to build a theatre in Crawley had been made as long ago as 1964. Incidentally, the name ‘hawth’ is supposed to come from a local pronunciation of the word ‘heath’. The Hawth’s box office is open from 10 am to 8.15 pm Monday to Saturday, with reduced hours during part of August. Booking for conferences and exhibition space is open from 9 am to 5 pm Monday to Friday. Technical details of sound, lighting and other systems for theatrical and musical performances. A menu for the café. Prices, menus and features for conferences. Teachers’ packs and newsletters for schools. The Hawth sits in woodland about half a mile east of the town centre, and has parking for 250 cars. The Hawth is about 10-15 minutes’ walk from both Crawley train station and Three Bridges train station. Buses 4 and 5 run between both stations and the Hawth, as well as the town centre, Langley Green, County Oak and Pound Hill, and are co-ordinated around evening performances. Up-to-date timetables are available on the Metrobus and National Rail websites. Join the A23 at Pease Pottage (junction 11 on the M23) and follow the signs to Crawley. At Southgate roundabout (the one containing a large football), take the third exit onto Southgate Avenue. Go straight on until the third set of traffic lights. Take the right-hand lane onto Hawth Avenue. The Hawth is half a mile along on your left. Join the roundabout where junction 10 of the M23 meets the A264. Follow the signs for Crawley (the third exit from the M23; the second from the A264) onto the A2011, Crawley Avenue. You will find yourself on a slip road, joining Hazelwick Avenue. You will very soon arrive at a roundabout with Tesco on your left. Continue straight on (i.e. take the second exit). After a couple of hundred yards, you will come to a set of traffic lights with Three Bridges train station visible to your left. Turn right onto the A2220, Haslett Avenue. At a large roundabout containing a Holiday Inn, take the second exit onto Hawth Avenue. Continue over a railway bridge and take the third exit at the roundabout to enter the Hawth. Users are actively prevented from seeing anything, and are taken to an almost blank screen which contains one or two links to another, equally inaccessible website. The Hawth website’s technical limitations make it so inaccessible to many human visitors (not to mention search engines) that it may even be in contravention of the Disability Discrimination Act.